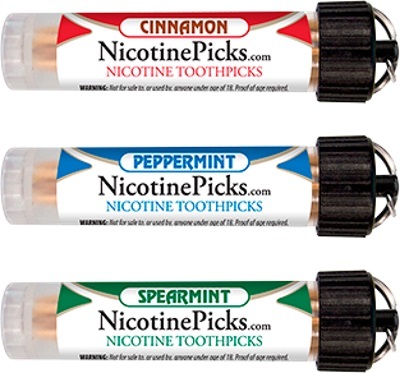 Nicotine Picks™ are Nicotine Toothpicks with a great flavor. 3mg Nicotine per toothpick, 20 Toothpicks per pack. Nicotine Picks aren't your father's Nicotine toothpick. Other nicotine items may not taste very well and don't last very long. Unlike other Nicotine solutions, Nicotine Picks™ are not soaked in nicotine. Nicotine Picks™ are infused under pressure so the entire fiber is exposed to nicotine and cinnamon flavor. The results are great tasting toothpicks that typically last longer than traditional nicotine products. Slightly chew the toothpick to control how quickly nicotine is being released. Perfect for the times you can't smoke. Many public places such as restaurants, movie theaters, sporting events, bars, offices, etc. ban smoking and even starting to restrict E-Cigs. Nicotine Picks™ delivers nicotine to your system for the times you can't vape, smoke or chew.